Happy Monday all! I hope you are enjoying your summer. We have been dealing with TONS of rain in our neck of the woods, so I was very thankful to have a few days of sunshine (even if it was super steamy) this past weekend. As you (hopefully) know, I have recently launched my pattern shop and one of the most popular patterns is Heading South. Today I wanted to share some of your gorgeous versions. So, get ready to be inspired! Sharon (@shashalaruequilts on Instgagram) has made a couple of toddler/crib sized versions…I love how she switched things up on the second one! And my friend Kim (@kimwhittingtonvester on Instagram) has finished this quilt top using Alison Glass’s Sun Prints for the geese and a Heather Givan’s Succulents print for the background…so good! If you have made a quilt using this pattern, I’d love to see it too. You can also add it to the “Sewing with Material Girl” Flickr group or use #headingsouthquilt on Instagram. 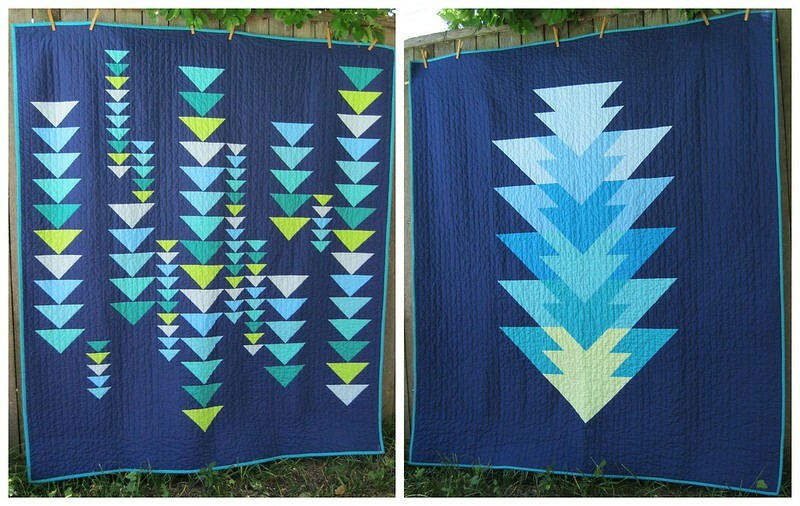 Thanks so much for featuring my quilt! Love your pattern. Man I cannot recommend “Initial K” patterns. She only gives you 24 hours from purchase to download. That’s not my procedure, so now I am just out money.